Four army men including a Major were killed in Pakistani troops firing along the Line of Control in Rajouri sector of Jammu and Kashmir. SRINAGAR: Four army men including a Major were killed in Pakistani troops firing along the Line of Control (LoC) in Rajouri sector of Jammu and Kashmir on Saturday. Defence spokesman Colonel N N Joshi told New Indian Express that Pakistani troops breached border ceasefire at around 12.15 pm and resorted to unprovoked firing on the army posts along the LoC in Keri Battalion area of Rajouri district of Jammu province. Sources said the Pakistani troops fired indiscriminately on army positions for half an hour. They said army men also returned the fire and targeted Pakistani army posts and bunkers with similar caliber weapons. “In the Pakistani troops firing, five army men including a Major, sustained injuries. 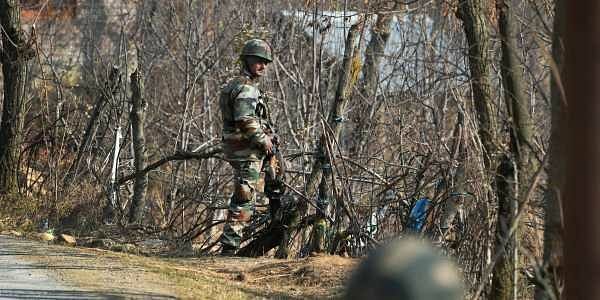 The injured were evacuated to military hospital, where three soldiers including the officer succumbed,” Joshi said. He said two other injured soldiers are undergoing treatment at the hospital. Sources said another injured army man succumbed to injuries in the hospital. With his death, the death toll of soldiers in Pakistani troops firing rose to four. Joshi said Army retaliated strongly and effectively to the ceasefire violation by Pakistani troops. “The martyrdom of Indian soldiers will not go in vain,” the defence spokesman said. Asked whether any damage was caused to the Pakistani side in the retaliatory firing by army, Joshi said, “We don’t know the damage caused to the other side. We are assessing the damage”. The soldiers killed in Pakistani troops firing were identified as Major Moharkar Prafulla Ambadas, Lance Naik Gurmail Singh, Lance Naik Kuldeep Singhand Sepoy Pargat Singh. Major Ambadas, 32, belonged to Bhandara, Maharashtra and is survived by wife Ms Avoli Moharkar. Lance Naik Singh, 34, hailed from Amritsar, Punjab and is survived by wife Ms Kuljit Kaur and a daughter. Sepoy Pargat, 30, belonged to Karnal, Haryana and is survived by wife Ms Ramanpreet Kaur and a son. This year 14 army men, four BSF personnel and 12 civilians have been killed in Pakistan troops firing along the Line of Control (LoC) and International Border (IB) in Jammu and Kashmir. At least 61 security personnel including 58 army men and 79 civilians have been injured in the border ceasefire violations by the Pakistani troops. Meanwhile, J&K Chief Minister, Mehbooba Mufti has paid rich tributes to the Major and three jawans killed in today’s cross border in Rajouri distrct. She conveyed her heartfelt sympathies to the families of slain soldiers. Deputy Chief Minister Nirmal Singh also paid tributes to the slain soldiers. He said the sacrifices rendered by the soldiers would be remembered forever. Singh offered condolences with the bereaved families and prayed for eternal peace to their departed souls.